Plantation shutters are so beautiful and add timeless elegance to any home, as well as regulating how much light and privacy enter inside. 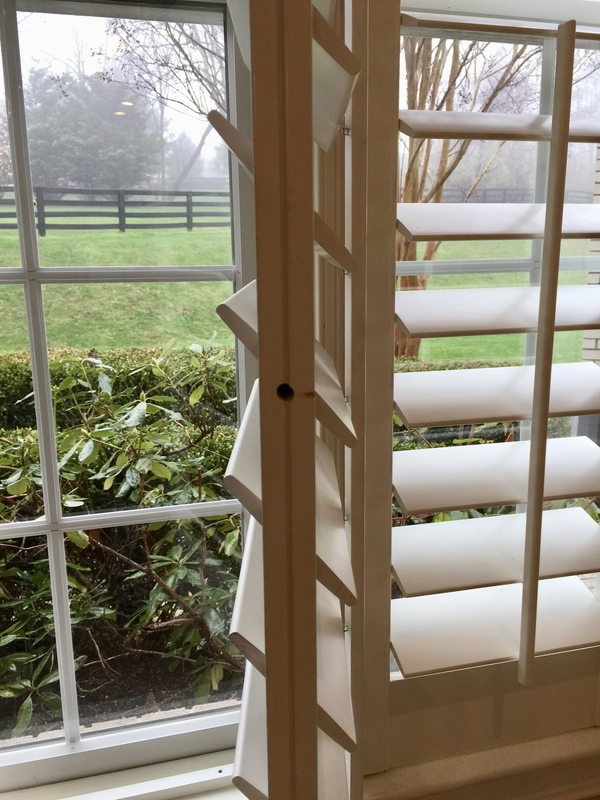 We have beautiful shutters throughout our home, including the kitchen, family room, and bedrooms. They look beautiful when the louvers are open and letting in natural sunlight. But they don’t look nice when the louvers are flopping downward and won’t stay in place after being set. The below picture shows floppy louvers on the plantation shutters in our kitchen. Luckily, the solution to fixing these floppy louvers is simple and only takes a few minutes. Open the shutter panel and examine the edges of the panel for small round holes. The holes should be evenly spaced and on both sides of the panel, inside and outside the shutter. This is the hole on the room side. This is the hole on the window side. Use a Phillips Head screwdriver and insert it in the hole and feel for a connection with the tension screw. Gently turn the screw clockwise while holding the louvers steady with your other hand, you will feel the tension screw firm up a bit. Do NOT over tighten. Do the same thing with all the screws on the other side of the panel. Test the louvers, they should be firm but not overly tight when moving. That’s it! So simple and we just adjusted the tension on our plantation shutter’s louvers. They look beautiful again! Notice the extension we added to the top of our window to give it more height? You can read more on that topic (HERE). Thanks for stopping in, hope this was helpful.